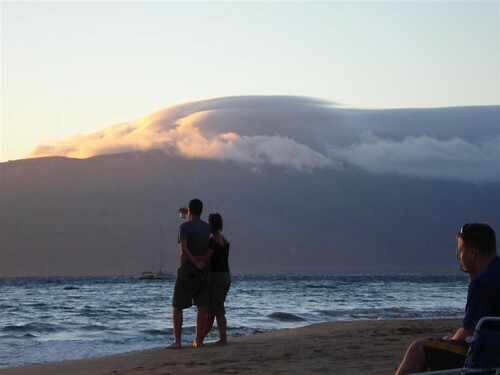 Click the link on ‘lenticular clouds’ to see even more amazing photos of this rare cloud. Yesterday I looked at these photos in wonderment and thought about writing about it, but never got around to it. Since I wasn’t able to share the knowledge I think my brain went nuts last night. All of my dream were centered around these clouds. I was near the beach with Jake and Kara, my grandma and the rest of my family as these strange clouds started forming over us. The wind was whipping around something fierce and it felt like a big storm was rolling in. But instead of escalating into something dangerous, the clouds came down to our eye level (it was as if they were intelligent, which was freaky) and we could touch them. They were full of mass. We could break off large pieces of them like Styrofoam, but it was very heavy, unlike Styrofoam. In my dream this was a big deal and I called Jake and my Dad over to witness what was happening. We knew there was something valuable about these seemingly intelligent clouds and we had to hide them. It turns out we weren’t the only ones interested in our new lenticular friends. Overhead about 20 different military jets swooped and flew. They never landed or came down,instead they very menacingly flew above us. We were in trouble and knew it so we started directing our clouds to a nearby forest and that is pretty much where I started to wake up. Very odd and a bit exciting, more exciting then seeing the lenticulars in real life, but you never know, maybe they’ll come down one day and end up being our friends. very strange… which makes me ask, what have you been doing in the daytime to have such strange things happen at night? Get tons of pics for me..